The Stingray Chair by Thomas Pedersen for Fredericia is a dynamic lounge armchair with an unconventional organic shape, offering seating comfort from all sides. The Stingray Chair provides ultimate seating comfort in various ergonomic positions. 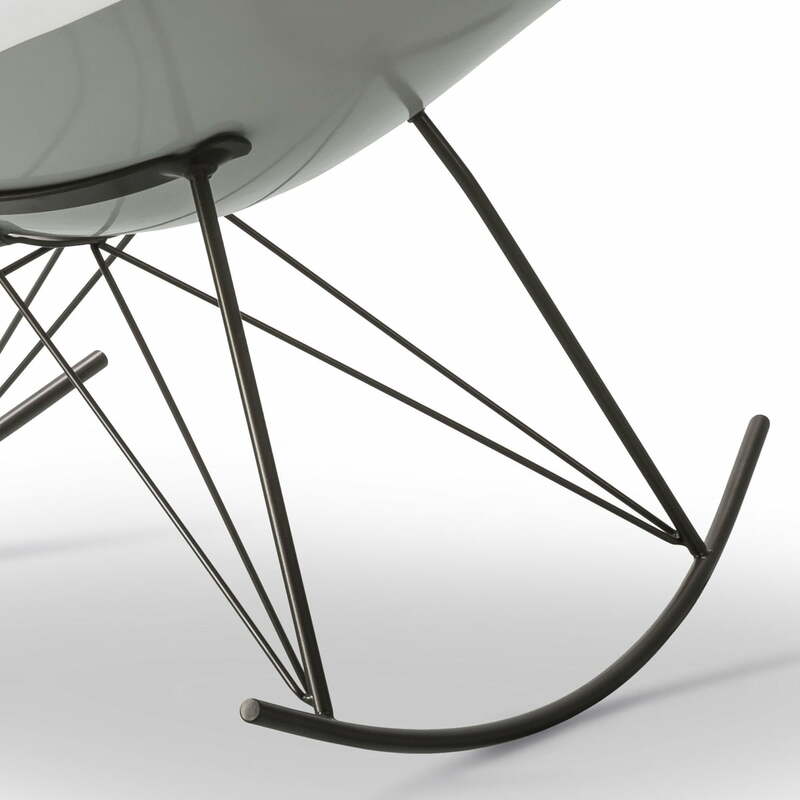 Designer Thomas Pedersen was inspired by the flowing shape of a stingray, which is how the chair got its name. If you look at it for long enough you can almost see the sea creature swimming through the living room. The seat of the armchair is made of polypropylene. The frame is made of powder-coated or chromed steel. The Stingray Rocking Chair with a stainless steel frame is also perfect as outdoor seating. 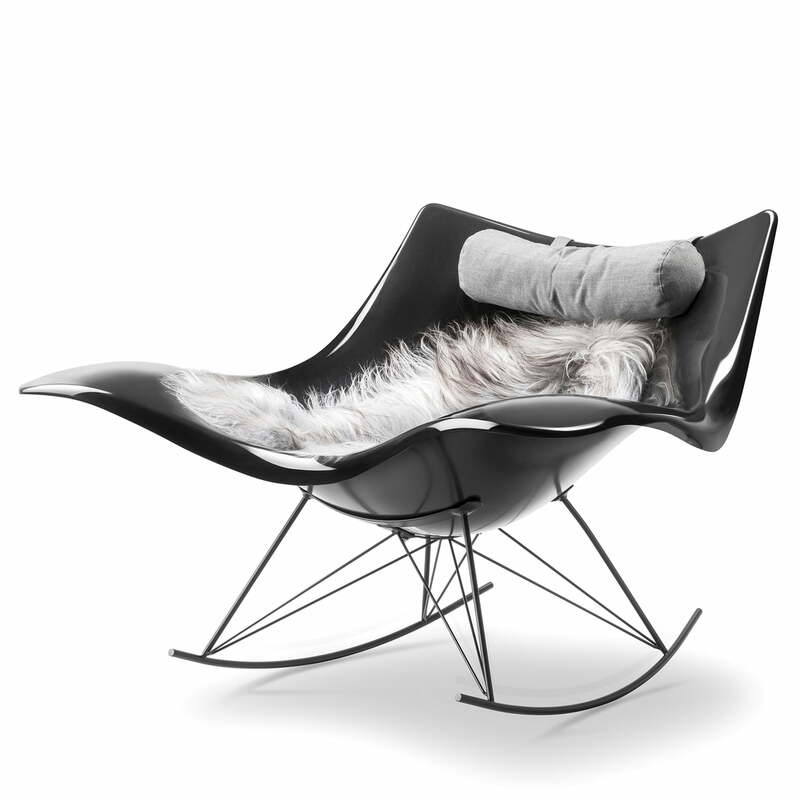 The Stingray Rocking Chair by Thomas Pedersen for Fredericia is available in black or white and is produced in Denmark. A neck cushion and a sheepskin are also available as accessories. 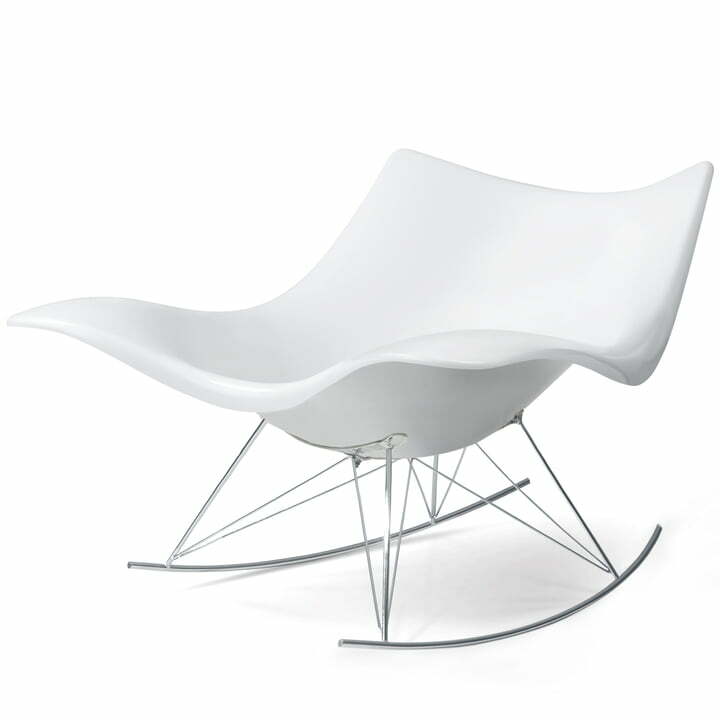 Isolated product image of the Stingray Chair in white/chrome by Thomas Pedersen for Fredericia. Stingray is a dynamic lounge armchair with an unconventional organic shape. Isolated product image of the Stingray Chair in black by Thomas Pedersen for Fredericia. Stingray is a dynamic lounge armchair with an unconventional organic shape. 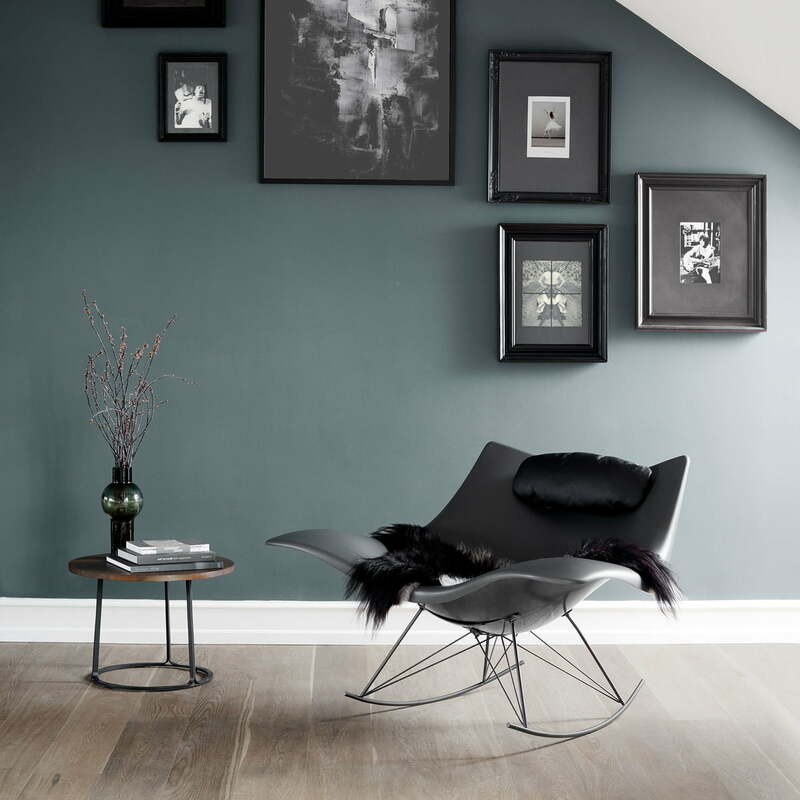 Group product image of the Stingray Rocking Chair by Fredericia: There is also a neck cushion and lambskin available for the Stingray Chair by Thomas Pedersen for Fredericia in black. Isolated product image of the Fredericia - Stingray rocking chair. 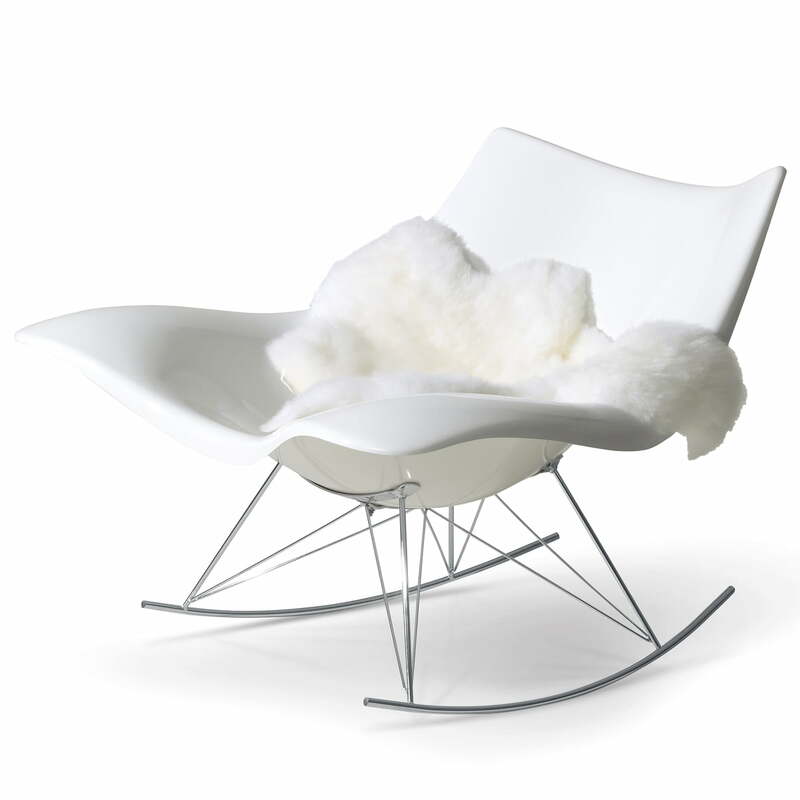 The rocking chair can also be beautifully complemented with the fur and neck cushion. Isolated product image of the Stingray Chair in grey by Thomas Pedersen for Fredericia. Stingray is a dynamic lounge armchair with an unconventional organic shape. 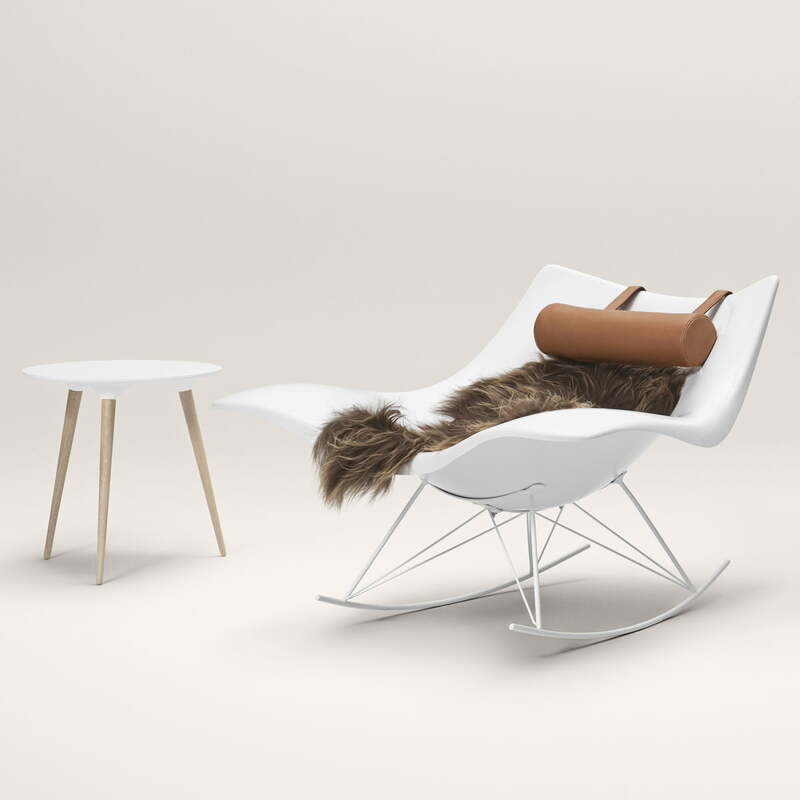 Group product image of the Stingray Rocking Chair by Thomas Pedersen for Fredericia in white with a chrome frame and the lambskin for the Stingray armchair. Isolated product image of the offer set Stringray + neck cushion (Free) by Fredericia. 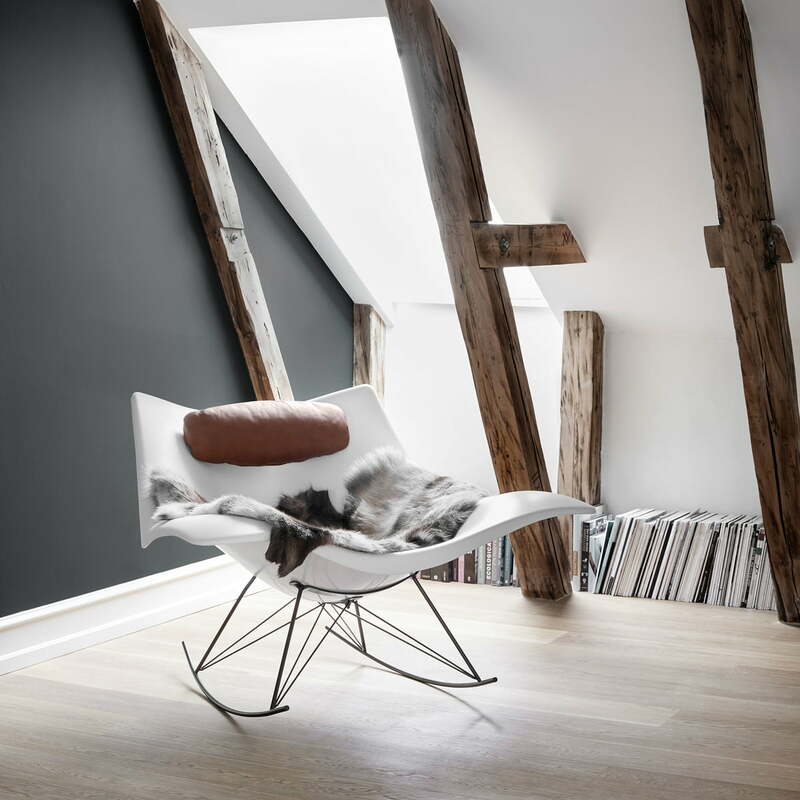 The Stingray rocking chair by Fredericia has now become a real design classic. The dynamic lounge chair by Thomas Pedersen has been living up to expectations for years with its unconventional shape and exceptional seating comfort. 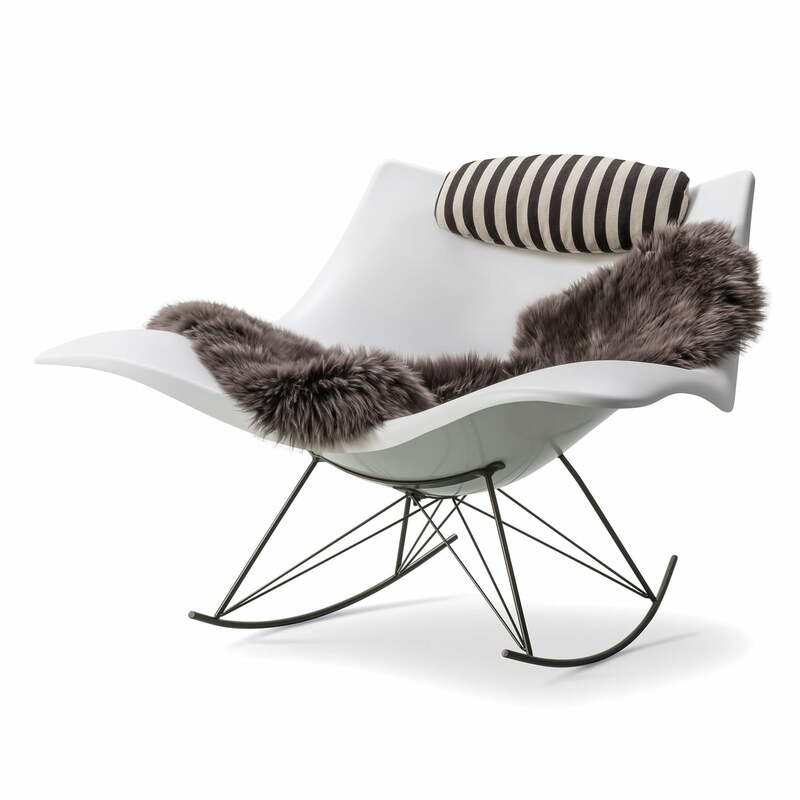 Isolated product image of the Fredericia - Stingray rocking chair. Fur and neck pillows make the already comfortable rocking chair even more comfortable and provide a touch of warmth. The Stingray Chair provides ultimate seating comfort in various ergonomic positions, and the additional neck cushion and lambskin throw only enhance that. 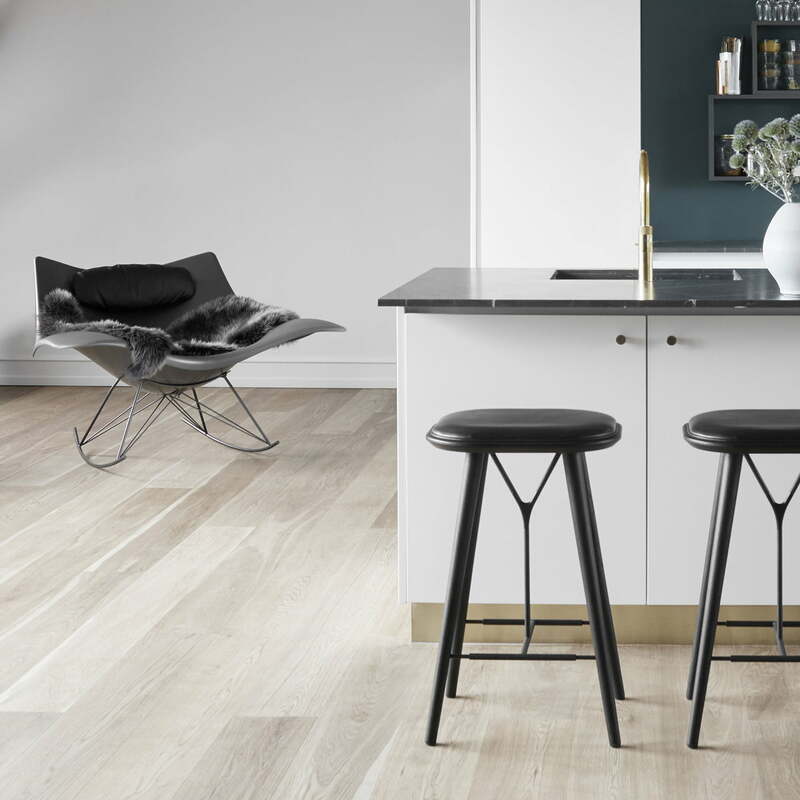 Designer Thomas Pedersen was inspired by the flowing shape of a stingray, which is how the chair got its name. Detail product image of the Fredericia - Stingray rocking chair. The seat shell of the chair is made of polypropylene. The frame is made of powder-coated or chromium-plated steel. 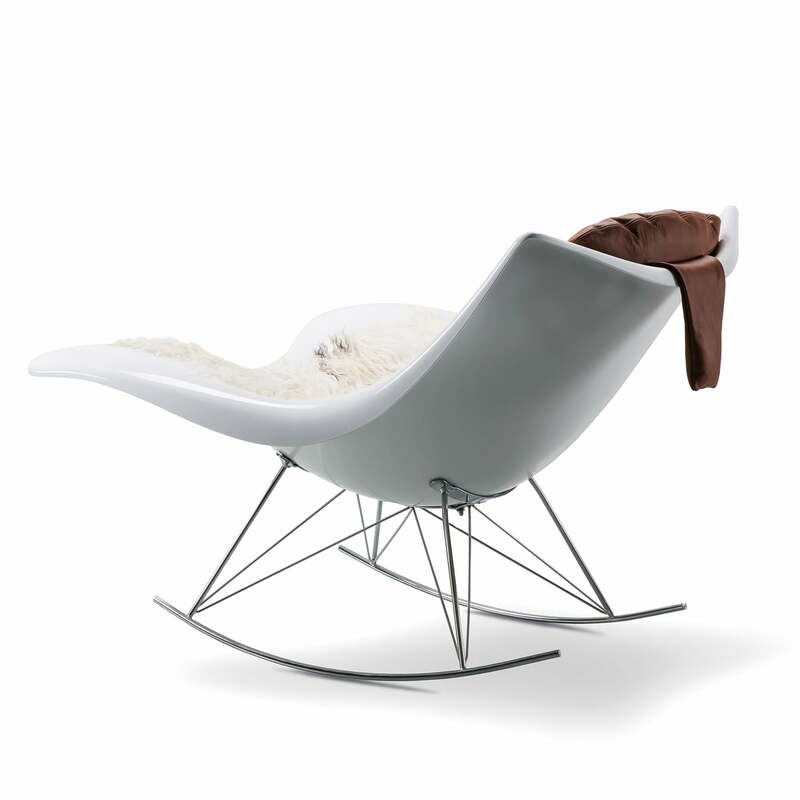 Isolated product image of the Fredericia - Stingray rocking chair. The design classic fits into any environment and captures everyone's attention thanks to its extraordinary. Isolated product image of the Fredericia - Stingray rocking chair The organic shape of the nature-inspired Stingray is the ideal retreat after a long day - a peaceful oasis.